Copper Sulfate is the right choice for Swimmers Itch relief and algae control. Comes in a fine granular formulation or larger marble size. Can be mixed with water and sprayed or evenly distributed with hand scoop or hand spreader. 10 1/2 to 20 lbs. per acre filamentous and chara control. Plankton algae doses are less. Formulation: Granular - Fine diamond or marble sized. Available for pick up or can be shipped - call for pricing. Additional shipping fees may apply depending upon ship to location. Cannot ship to all states. 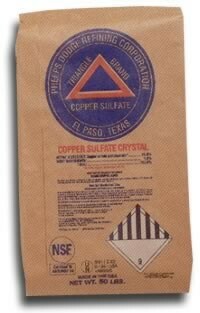 The Copper Sulfate Product Label is available for download in pdf. Sold in 50 lb bags. Quotes available through email or over the phone at 1-877-430-0143.